Looking to get married outside? Chippenham Park Gardens is stunning for an outdoor ceremony. We love an outdoor wedding ceremony. The light, the natural sounds, the smells, they all add to creating a wonderful atmosphere on your wedding day. Chippenham Park Gardens makes for an absolutely stunning backdrop for an outdoor ceremony with 300 acres to choose from! Krishan and Emma took full advantage of the gorgeous settings at Chippenhm Park having a civil ceremony next to the lake and an Indian ceremony in the gardens close to the house. Krishan and Emma contacted us through Bridebook wedding planner to talk about their wedding day and we are so happy they chose us to film their special day. With a mixture of their English and Indian cultures their wedding day was incredible. 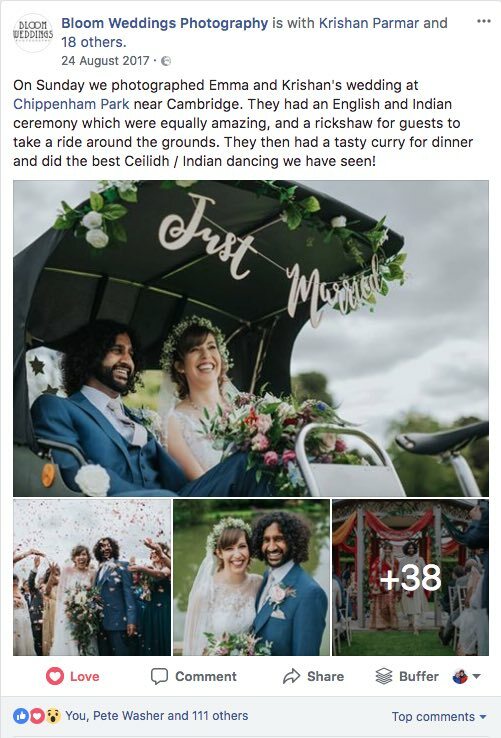 These kinds words from Emma about their wedding film gets us all emotional every time we read them, thank you so much for having us Mr and Mrs Parmar! We started by filming Emma getting ready at their home in Cambridge. Emma’s beautiful hair was styled by the very talented Eileen Hanley who is based locally to us in Newmarket. The flower crown was created by Samantha from Wild Poppies Flowers. Samantha also created Emma’s elegant bouquet, the corsages and floral decorations – they took our breath away. Emma’s makeup artist was Lucy Anne based locally to us in Cambridge and it was lovely chatting to her throughout the morning. Her attention detail creating gorgeous looks for Emma and her bridesmaids was amazing. We drove to Chippenham Park for the final preparations and to capture Krishan greeting the guests ahead of the civil ceremony. We could feel the nervous excitement and capturing the love between everyone really set the tone for the whole day. The violin solo playing for the guests as they took their seats was beautiful. We found out later it was one of their guests Alison Galbraith. We love it when the details are meaningful and make the day so special. The civil ceremony was wonderful with happy tears and personal vows which Krishan and Emma wrote. We loved working alongside Anii and Chris from Bloom Weddings Photography and wow their photos of the day are stunning! They were both fabulous to work with. We were all aware of not getting in each others way and communicating well so that we could get amazing shots. The garden games and rides in the Rickshaw supplied by Outspoke Training was so much fun. The connection between Krishan and Emma was so lovely to capture particularly during the couples photos. There were lots of laughs between us all! The outdoor Indian wedding ceremony was the next formality of the day. Krishan and Emma changed into traditional Indian dress supplied by Milans in Leicester. They both looked incredible and when Krishan saw Emma there were more happy tears. We struggled to hold back the tears too! We absolutely loved the ceremony which very much focused on their commitment and respect for each other and their family and friends. This continued throughout the speeches too. They talked so highly of each other and their gratitude for their lives together. After the speeches the wedding breakfast started and wow what a feast! Delicious Indian cuisine supplied by Indus Catering. Krishan and Emma then changed back into their original wedding attire for the cutting of the cake and first dance. Ceildh dancing kicked off the partying taught by Emma’s parents followed by Indian dancing taught by Krishan’s brother. We loved everyone’s enthusiasm and giggles when people got stuck or found themselves without partners! The night ended with everyone lighting sparklers and cheering the new Mr and Mrs outside the marquee. Spectacular photos resulted and a perfect end to a wonderful day. Editing the films was great fun and Krishan and Emma can now look back on their day and relive it with their family and friends. Thank you so much for having us Mr and Mrs Parmar. Getting married at Chippenham Park and looking for a videographer? Contact me below, I’d love to capture your special day. Next Post Four Counties Wedding Awards – One To Watch!